God loves you personally and intimately through Jesus in the Holy Spirit. Each of us has a way in which we can best grow and serve the Lord in love. We call this a Vocation. A call to priesthood in the Church is much more than just an individual, personal desire to serve and lead. While the call comes from God, it is mediated through the People of God, the Church. Fr. 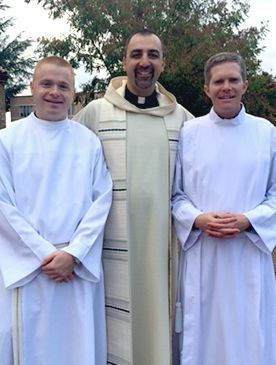 Bryan Dolejsi (center), with then Seminarians Chris Hoiland and Chad Green, who are now ordained priests for the Archdiocese of Seattle. The Vocations Office of The Archdiocese of Seattle is here to help people like you discern your primary vocation throughout the Archdiocese. We specifically work with those interested in joining the Archdiocese of Seattle as a priest and reference others to religious life options in our area. The Vocations Office also provides ongoing formation and resources for our seminarians studying for the Archdiocese of Seattle. The primary person in charge of these activities is the Director of Vocations, Fr. Bryan Dolejsi, who works on behalf of Archbishop Sartain. Every person has a vocation, or a fundamental way we are called to love by God. Our vocation brings us closer to God and each other. In a Catholic context, there are primary vocations for how each of us are called to love: to grow as priests, prophets and kings/queens of Jesus through our Baptism. Within this universal call to holiness most Catholics are called to the vocation of Marriage (and some as parents). Some are called to the Permanent Diaconate. Still others are called to love through Priesthood or Religious Life (for women and men). Am I Qualified to be a Priest? The Archdiocese of Seattle looks for qualities of a man who could serve as a pastor of one of our local parishes. These qualities include faith, a desire to grow in prayer and lead others in prayer, leadership, compassion, a heart for service, ability to preach and teach the Sacred Scripture and the Catholic Tradition, and a healthy lifestyle towards exercise and positive relationships. The process of seminary formation takes anywhere from 5-9 years. How can I recognize God’s call? God has a specific calling for you! The process by which we learn to hear our calling and discover our vocation within the Church is called Discernment. Do not be afraid when love makes demands. Do not be afraid when love requires sacrifice. Finding the right vocation to serve God within the Church can sometimes be a challenging question. We have created an online vocations assessment to help. Seminarians in the Archdiocese of Seattle have begun their journey toward the priesthood. Meet some of our current seminarians and learn more about seminary life. A member of a religious order belongs to a community bound together by a common charism and the vows of poverty, chastity and obedience.